MT Wireless shows a selection of phones at its Main Street Store, between the First Resort and Navigator Travel. 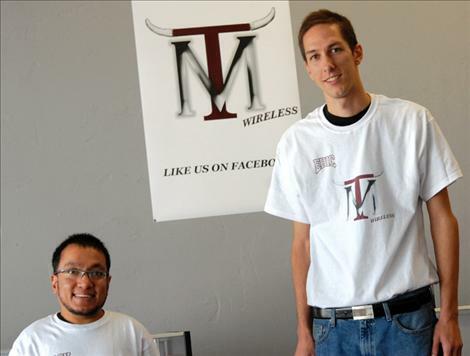 Mack Mackwani, left, and Eric Delphy opened MT Wireless on Main Street Polson last week. POLSON — A new cell phone business described by an owner as “a one-stop shop for everything cell phone” opened in Polson this month. 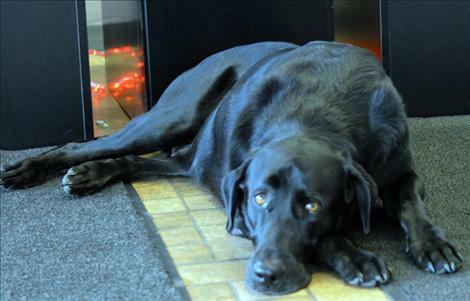 MT Wireless, located at 223 Main Street between Navigator Travel and The First Resort is owned and run by Mack Mackwani and Eric Delphy, with help from Oscar, their dashing black office dog. The two men, who worked together for five years in Missoula, saw a niche in Polson — to provide help and great service for cell phone customers — and thought the timing was right to start a new business venture. MT Wireless requires no credit checks, offers phone selection for both Verizon and AT&T, and sells service to offshoots of both — H20 wireless for AT&T and Red Pocket for Verizon. They also have a great selection of phones, accessories and gadgets, “iPhones, Galaxies, screens and cases,” according to Delphy. 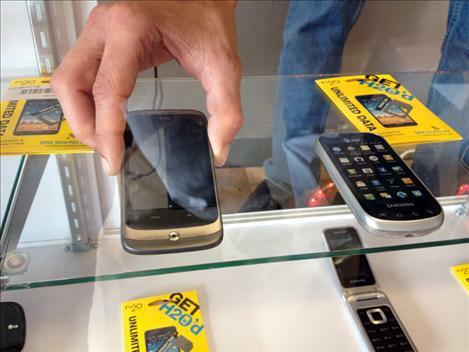 “We do phone trades,” he said, if customers want to upgrade or just sell their phone. “We try to always have the hip stuff,” he added, “and the phones will be ever changing,” with new stock coming from trade-ins and online. With a big screen TV on the wall, an X-box and a Playstation III, the store is ready for younger customers too. Plus they’ll offer daily and weekly specials. Their first day of business was Oct. 1, and they are planning a grand opening in their Griz-colored store in the next few weeks. Mackwani and Delphy are excited to get to know people in Polson, and Oscar always likes a pat. Hours are Monday through Friday from 9 a.m. to 6 p.m. and on Saturdays from 10 a.m. to 5 p.m.